looks like a USAF trainer but it is only a disguise. Michael Kasyan's Berkut was the first kit of the 540 version. The first IO-540 was proposed for a Berkut in 1996 by a builder. It required the construction of a new engine mount, engine mount ears and new cowls by Ronneberg. This led to the Lycoming IO-540 engine being offered as an option for the Berkut. 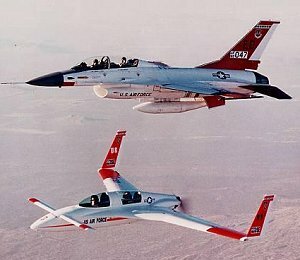 Shortly thereafter an IO-540 was installed by Ronneberg and Misha Kasyan, whose airplane has graced the covers of many magazines in its Air Force Flight Test neon orange. Misha “sVoloch” Kasyan was born in a small village on the island of Sakhalin, an extremely remote area north of Hokkaido Japan where the average winter snowfall is 21 feet. His parents were Speznatz (special forces) reconnaissance officers during World War II. Kasyan entered college at 16 to study music and graduated at the age of 20, a classical bassist in the Kishinev Philharmonic in Moldavia. He came to the United States in 1979 and settled in Los Angeles. In 1989, he found a newspaper article on Long-EZs featuring the Santa Monica EZ Squadron and was thrilled. He set out to meet Dave Ronneberg and started working for him by sweeping floors in the shop. In 1991, Kasyan rescued a baggage door from the trash and asked Ronneberg if he could build an airplane around it. Ronneberg gave him access to the molds and away he went. Finally, with the help of friends, his airplane flew in 1996 as the Berkut 540 and has been featured in numerous magazines. In 1997, Misha obtained his pilot’s license and quickly learned to fly his Berkut. Subsequently the IO-540 became a more popular installation on the Berkut and is now offered as the standard engine configuration, though the IO-360 is still an option for those not needing quite as much horsepower. Unfortunately, Misha’s airplane was in an accident in July of 2000 at Jackpot, NV at the hands of a friend. Misha was rebuilding his airplane in the Berkut Engineering shop which provided an excellent opportunity for would-be builders to see a Berkut in progress. The airplane was ready to fly at the Reno Air Races but was grounded on September 11. As soon as the restrictions were lifted from Santa Monica airport, the aircraft flew and has been burning up the skies ever since. 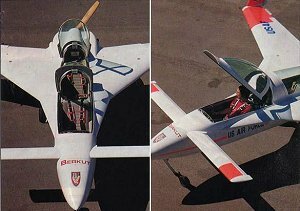 Another Berkut 540 flew its first Reno Air Race in 1999 and finished second in the Silver Class behind a fast Glasair III and ahead of six other Glasairs, with a winning speed of 261.7 mph. The airplane was equipped with a 308 hp Lycoming IO-540 built by Ron Monson of Performance Aero Engines and turned a Klaus Savier fixed-pitch prop. Dave Ronneberg piloted the aircraft to its outstanding finish and found the Berkut's excellent, unrestricted visibility to be a significant advantage throughout the race. The late 1990's and early 2000 have seen improvements to the Berkut kit and components. A few highlights include redesigned landing gear constructed in-house that is also used in Shirl Dickey's ERacer. The biggest accomplishment has been the completion of tooling for molded canard and wings with winglets attached. 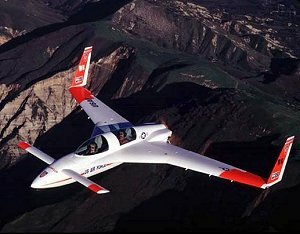 The only foam in the airplane are the canard and wing tips. This combination not only comes in weighing less than a conventional foam wing, but stronger and faster to build. The airplane now incorporates over 100 molded components and has the best fit and finish found in any airplane in the kit industry. Length:	18 ft. 6 in. Wingspan:	26 ft. 8 in. Wing area:	110 sq. ft.
Wing loading:	18.1 lbs./sq. ft. Minimum Landing/Takeoff (Runway):	2000 ft.